The view toward Mount Katahdin and Katahdin Lake from atop Barnard Mountain in the Katahdin Woods & Waters National Monument area in northern Maine. PATTEN, Maine — Yellow signs blaring “National Park No!” greet Tim Hudson as his truck nears Katahdin Loop Road on a recent morning. He chooses to ignore them. On any given day, Hudson restocks the toilet paper in outhouses, empties the trash, and when necessary, wields a large potato fork to breach the beaver dams that routinely flood the entrance to the nation’s newest national land monument. His cellphone doubles as the park’s main phone, and he fields all manner of calls, from which bike trails are open to where visitors can find moose. This is what you do when you’re not only the superintendent of the Katahdin Woods and Waters National Monument but also its only full-time employee. You do it all. Tim Hudson of Bangor, Maine, is Superintendent of the Katahdin Woods & Waters National Monument. 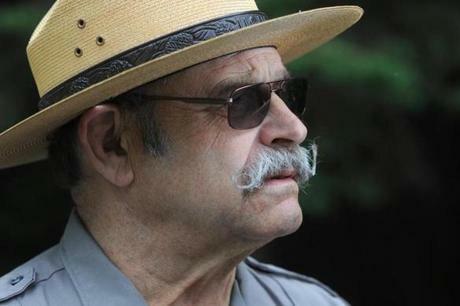 More than the park’s mainstay, he is also its most visible defender, navigating the treacherous currents of local and national politics since taking charge of this pristine piece of northern Maine, 87,000 acres of remote wilderness designated for preservation last summer by Barack Obama. Hudson has had to mollify the anger of residents wary of the federal government’s control of so much local land, as well as the state’s firebrand governor, Paul LePage, whose opposition to the park’s protected status is so strident he has refused to allow the superintendent to post signs on nearby state roads. The East Branch of the Penobscot River flows through Haskell Rock Pitch. Even as the land’s new prominence shows early signs of drawing tourists and local businesses are seeing benefits, Hudson and environmental advocates who have lobbied for its preservation are grappling with an existential question: Will Katahdin survive as a monument? In April, President Trump issued an unprecedented executive order directing Interior Secretary Ryan Zinke to review 27 national monuments created since 1996. During a visit last month to the area, a vast preserve of moose, maples, and dramatic views of the state’s tallest peak, Mount Katahdin, Zinke gave mixed signals about what he might recommend to the president, voicing support for commercial access on the land but also suggesting it could become a full-fledged national park. His recommendations are due by the end of August. 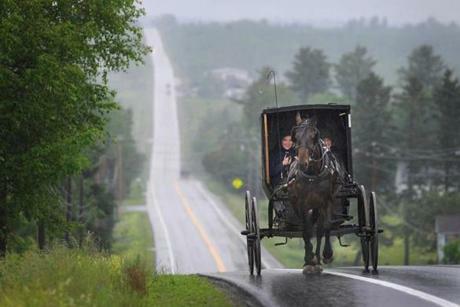 The Amish use horse-drawn buggies while traveling in the towns just to the east of the Katahdin Woods and Waters National Monument. Still, Trump’s order has reopened a wound that had just begun to heal. It has reignited calls from opponents to rescind the monument and doused the hopes of supporters who have seen early signs the federal designation could provide a significant increase to tourism and boost to the local economy. It has also cast a pall over decisions by some Patten residents who have made significant investments since Obama established the monument adjacent to Baxter State Park and the headwaters of the Penobscot River, a vast tract of woods renowned for its starry nights and hardwood forests that was donated to the federal government by the family of Roxanne Quimby, the cofounder of Burt’s Bees. “There’s a cloud hanging over all the positive work that’s been done over the past several years,” said Lucas St. Clair, Quimby’s son, who led the campaign for the monument and has pledged a $40 million endowment to support it. Among the local residents left in limbo by the president’s executive order is Christina Shipps, who recently bought a townhouse nearby to open a café. At first, Shipps was no advocate for the monument. She empathized with those who worried about how federal regulations could affect the region, and she wasn’t happy about how Quimby had forced out many of those who camped on her land. 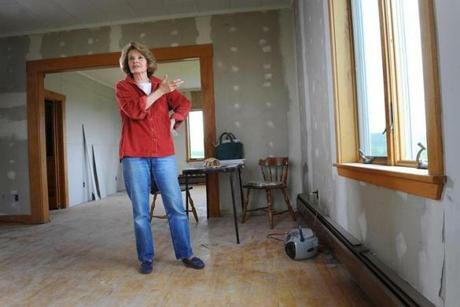 Christina Shipps stands in what would be the dining room of a new cafe she was creating in Patten, Maine. But after Obama designated the monument, she started to see its promise, especially after experiencing a surge in bookings at her other business, a local inn called Mount Glory Farm. “I can attest to the fact that the monument absolutely stimulated tourism here,” she said. Now, she worries the president’s affinity for LePage, who helped win a fiercely contested single electoral vote in northern Maine, could reverse the hard-won progress. She’s no longer sure she will continue converting the townhouse into a café. “If the monument is removed, it would send this area into a downward spiral,” she said. Nate Richardson built this addition to his hardware store in Patten, Maine, in anticipation of added tourism due to the nearby Katahdin Woods & Waters National Monument area. A neighbor, Nate Richardson, also worries about losing a considerable investment. 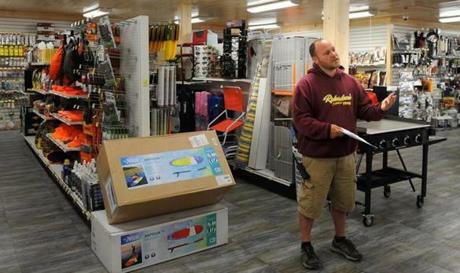 Over the winter, spurred by the creation of the monument, he spent $150,000 to add a large sporting goods department to his hardware store, which is now stocked with fishing rods, camouflage vests, coolers, and more. Trump’s order felt like a sucker punch. “I’m concerned,” said Richardson, an early supporter of the monument who now worries it will take him much longer to repay his loans if Trump rescinds the designation. Still, fear of the government remains pervasive in this 176-year-old lumber town, where residents grew accustomed to the leniency of the logging companies that long owned much of the land and allowed residents to build hunting camps and run snowmobiles there. In a nonbinding referendum on the monument last year, Patten residents voted more than 2-1 against it, joining the surrounding towns of East Millinocket, Medway, and Millinocket in opposition. But fewer than 20 percent of the town’s 1,000 residents voted. On a recent evening at Debbie’s Deli & Pizza, one of the few restaurants in town, many of the diners remained steadfast in their disapproval. Bart Dickinson, 53, a salesman, acknowledged that the monument would attract more visitors. But it will only benefit a small number of people, he said. Dickinson was referring to Acadia National Park about 150 miles to the south, where 3.3 million people visited last year. By contrast, Katahdin Woods receives a paltry number of visitors. 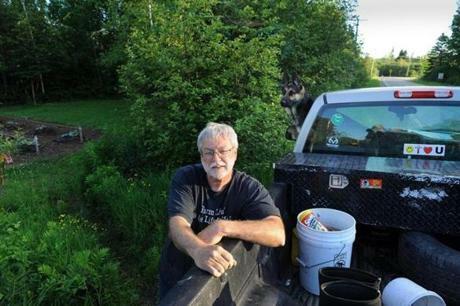 "My whole world is there," said Carl Hunt of Stacyville, Maine. Hunt is a licensed Master Maine Guide. On average, just 20 cars a day use the Loop Road, the most touristy part of the monument. But that’s about four times more than the number of vehicles that used the road before Obama designated the woods a monument. That’s reason for optimism, Hudson said. Nearly 1,900 vehicles have entered the monument since it opened shortly before Memorial Day, more than triple the number of visitors in a typical year, Hudson said. And although opponents’ signs remain ubiquitous, Hudson and other supporters insist that public opinion is turning. 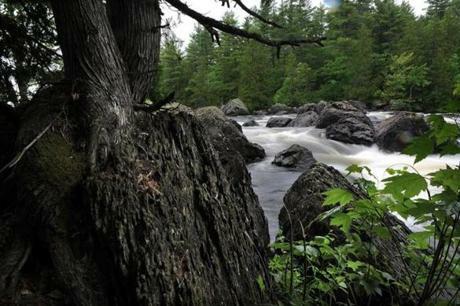 They pointed to a recent analysis by the Natural Resources Council of Maine of more than 190,000 public comments submitted to the Department of the Interior over the past two months. Nearly all who wrote supported the monument. Critics say many of those comments came from members of environmental advocacy groups. Hudson and some 50 volunteers have started a good-will campaign, trying to debunk myths about the monument, he said. For example, he has explained repeatedly that there are no special federal clean-air rules that would ban future lumber mills from opening nearby and that snowmobiles will be allowed to operate in designated areas throughout the monument. He has also noted that the monument won’t sap the state’s tax base. Over the next five years, the National Park Service is required to pay the state 1 percent of the land’s value, or what it paid the previous year in taxes, whichever is higher. After that, the government will pay the state on a formula based on property value, Hudson said. 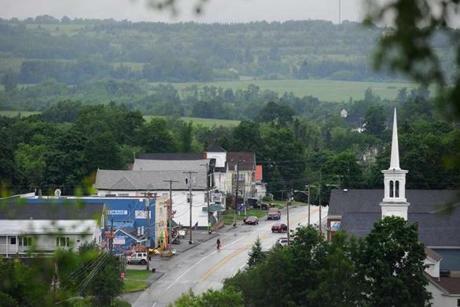 Many believe that the fate of the national monument will have a profound economic affect on Patten, Maine. One unlikely outpost for reaching the public is at Patten Lumbermen’s Museum, which chronicles the area’s logging over the past four centuries and how the industry has suffered in the digital era, as paper use declines. The National Park Service has set up a “visitor contact station” at the museum, where they promote the monument. In their first two weeks on the job, volunteers recorded the names of 43 people who cited interest in the monument. Among the visitors was Tom Bull, 46, who drove up from Freeport to show his support for the monument. Officials at the Lumbermen’s Museum, like many residents, had mixed feelings about allowing the government to set up a station there. “We get a lot of donations from logging companies,” said Rhonda Brophy, the curator. But she and others said they realize the town is likely to benefit more from tourism than logging in the coming years, noting that visits to the museum have increased about 25 percent since the monument was established.